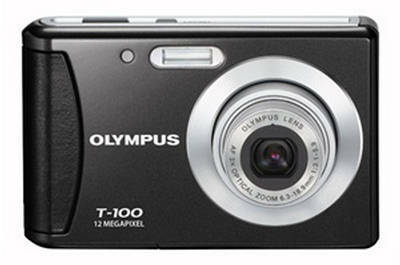 The Olympus T-100, like most consumer point and shoot digicams, is built with value in mind. It offers a large number of features in a largely plastic body, making the majority of its appeal apparent to entry-level photographers. The camera measures 3.7" by 2.4" by .9" and weighs 4.3 ounces without a battery or a memory card, making it comparable in size with most point and shoots. The T-100 captures images using a 1/2.3" megapixel image sensor with a focal length equivalent to a 35mm camera with a range between 36 and 108mm. The camera has a 3x optical zoom and a 4x digital zoom, as well as an aperture range of f4.6 in Wide and f8.5 in Telephoto. The camera has a 2.4" LCD display with a resolution of 112320 dots and a 2-step brightness adjustment system. Like most point and shoots, it does not feature a viewfinder. The camera has a CCD Contrast Detection focus system. Its focus range in Normal mode is between 23.6" and infinity in Wide and 39.4" and infinity in Telephoto. In Macro, the camera's range is between 7.9" and infinity in Wide and 23.6" and infinity in Telephoto. In Super Macro mode, the camera's range is between 1.97" and infinity. Focus modes include iESP Auto, Spot Autofocus, Face Detction Autofocus, and Autofocus tracking. The T-100's shutter speed is between 1/2000 and 1/2 of a second. In Candle scene mode, which offers longer exposures, the camera's shutter speed can be set to up to 40 seconds. The camera's ISO sensitivity can be set automatically or to ISO 100, 200, 400, 800, or 1600. Exposure metering can be set to Digital ESP Metering or Face Detection Autoexposure. White balancing can be set to automatic or to presets such as Daylight, Overcast, Tungsten and 3 Fluorescents. Exposure compensation can be set between -2 and +2 EVs in 1/3 EV steps. Digital image stabilization is built into the camera so as to help prevent blurred shots. The camera stores images in JPEG files and movies in AVI motion JPEG. The camera saves images at a maximum resolution of 3968 by 2976 at an aspect ratio of 4:3 and 1920 by 1080 at 16:9. The camera captures videos in standard definition resolutions of 640 by 480 or 320 by 240 at either 30 or 15 frames per second. The camera's shooting modes include Intelligent Auto, Program Auto, Digital Image Stabilization, Magic Filter (which can be set to Pop Art, Pinhole, Fisheye, or Drawing), and Scene Modes (which can be set to Portrait, Landscape, Night, Night + Portrait, Sport, Indoor, Candle, Self Portrait, Sunset, Fireworks, Cuisine, Documents, and Pets) and Movie. The camera has a panorama system capable of stitching together up to 10 frames automatically. Limited in-camera editing can be done to correct for red-eye, fix lighting, resize and crop images. A flash is built into the camera and offers automatic flash, red-eye reduction, fill-in, and flash off settings. Its working range is up to 14.4' at ISO 800 at Wide and 6.6' at ISO 800 at Telephoto. The camera has a 2-second and a 12-second self timer. The camera includes a USB port to transfer files and 10.8 MB of internal memory. This is too small to take more than perhaps one photo, requiring that you add an SD or SDHC card (supported by this camera) in order to take pictures. The camera also includes an A/V out making it easy to connect the camera to televisions or other monitors. The camera includes a lithium ion rechargeable battery, rechargeable in camera via an AC adapter, rated at 190 shots between charges. Unlike other consumer point and shoots, this camera does not offer any options for shooting video in HD, nor can it display HD video. Olympus makes available a handful of accessories for the T-100, such as casual style cases (in Beige and Black Dot), a variety of Harley Davidson themed cases, Neoprene armbands, horizontal cases, and sleeves, and premium compact leather cases. Replacement lithium ion batteries are available as are wrist and neck straps.